Editor/Author Merriam, Sharan B., Caffarella, Rosemary S. and Baumgartner, Lisa M.
The authors have gathered the seminal work and most current thinking on adult learning into one work. Addresses a wide range of topics including: Who are adult learners? How do adults learn? 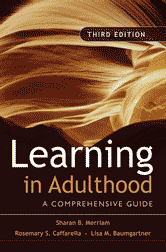 Why are adults involved in learning activities? How does the social context shape the learning that adults are engaged in? How does aging affect learning ability?